This entry was posted in 12 Steps, acceptance, Brokenness, childhood memories, Faith, God, Healing, relationship with Christ, Trust, Uncategorized and tagged Addiction, forgiveness, Inspiration, relationships, tragedy. Bookmark the permalink. Robin this is so brilliant and so well-written! If wouldn’t look so self-aggrandizing I’d post it all over the internet anywhere I could. Seriously. What a beautifully done review!!!! I’m sorry I didn’t come back to comment here sooner. YOU are the writer to be applauded. Putting yourself on display for all the world to see takes courage. Not only did you face down the demons that come with addiction, you did it with grace and style. And I could have written more. For instance, I could have pointed out how you went from a controlling mess looking for attention to being a person who ended her book with a list of gratitudes. I’ve never seen that done before. Take in the well-wishes … you’ve earned them all. Amen Robin! I am nearly finished reading Sober Mercies and I agree with all you say in your review and appreciate how well you articulated my thoughts and sentiments. I wouldn’t be surprised if Jericho Books was interested in using your review to promote Heather’s book. Hmmm??? Thanks, Jack. From your mouth to God’s ear! Thanks for following my blog and taking the time to write. It’s so appreciated. 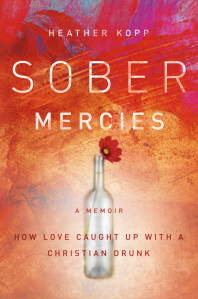 I wanted to share Robin Luftig’s post (review) about Heather Kopp’s memoir, Sober Mercies, with everyone who reads or visits my blog on occasion. I am nearly finished reading it and Robin’s comments about Heather’s book hit the proverbial nail on the head as far as I’m concerned. Heather also has a blog that you might want to check out at soberboots.com if you’re interested in what she has to say.